While President Trump slams CNN as "fake news" on a regular basis, its historically progressive rival MSNBC has made remarkable strides among viewership. MSNBC has now beaten CNN among total primetime viewers for 29 of the last 30 weeks dating back to the start of 2017. CNN topped MSNBC among primetime total viewers from both July 2015 and July 2016 to date, but trails in 2017. Year to-date, MSNBC is the fastest growing cable network in total viewers, adding 865,000 sets of eyeballs while CNN has lost 128,000 viewers over the same time period, according to Nielsen's weekday primetime data. MSNBC's total viewership is up 78 percent compared to this time in 2016, which was an extremely newsworthy period that included the GOP convention and the Hillary Clinton email drama. (On the flip side, CNN brought in stellar ratings in July 2016, dominating MSNBC among convention coverage). 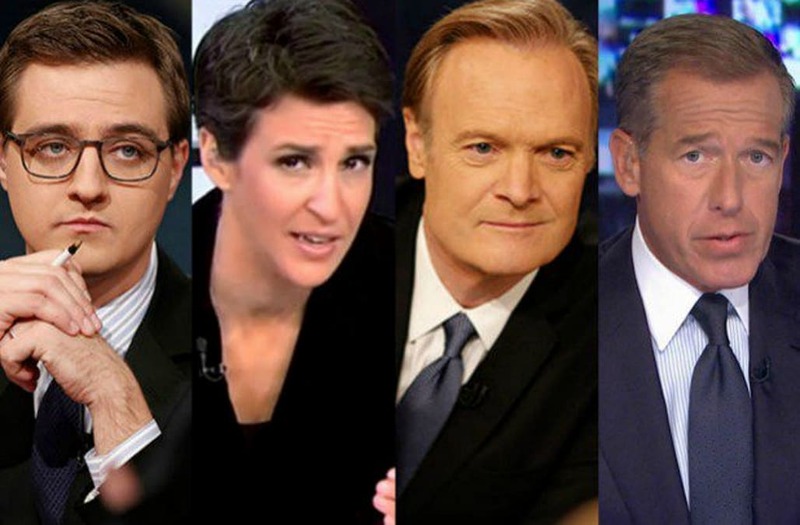 MSNBC's primetime lineup is a major reason for the growth, as their lineup of Chris Hayes, Rachel Maddow and Lawrence O'Donnell hold Trump accountable on a nightly basis. While CNN isn't exactly pro-Trump during primetime, Anderson Cooper and Don Lemon typically rely on interviews and guests, as opposed the MSNBC hosts who have been attracting viewers by opening shows with powerful left-leaning political monologues. Also Read:Is 'Morning Joe' Host Joe Scarborough Planning a Bid for the Presidency? The Hill media reporter and columnist Joe Concha told TheWrap he believes that "MSNBC is simply more transparent" about what they are in terms of its progressive tilt, and audiences respect that. He said having true opinion hosts during primetime "allows them to be more provocative" than CNN. In addition, the president isn't doing CNN any favors. "Trump's attacks on CNN impact it in the sense that no Trump supporter will watch the network now based on preconceived notions alone," Concha said. "So, if liberals are watching MSNBC and conservatives and populists watch Fox News, there ain't much leftover for CNN." As a result, MSNBC trails only Fox News in primetime total viewers among all of cable for the year, beating powerhouse networks such as TNT, AMC, ESPN, HGTV and USA. MSNBC is now on target to average 2 million viewers in primetime for the fifth consecutive month in July, while CNN has never had a streak that long in its history. Historian Andrew Tyndall, who monitors all-things television news for his website Tyndall Report, thinks that MSNBC is picking up viewers who are giving up broadcast nightly newscasts in favor of more fiery opinions found on cable. "The most important ratings trend this year has been the overall increase in the total cable news audience for all three channels combined. Simultaneously, there has been a reduction for the broadcast networks' nightly newscasts, so the total TV news audience may be stable overall, with a switch in preference from broadcast to cable," Tyndall told TheWrap. Tyndall continued: "This makes sense in the highly charged political atmosphere of the first six months of the Trump Administration, since cable news tends to be more politically oriented, whereas broadcast news is more general in scope." But MSNBC is thriving beyond primetime, posting its most-watched month ever during weekdays from 9 a.m. through 5 p.m. ET in June. MSNBC is on pace to beat CNN in July in the dayside category for the first monthly win since October 2012. "Everyone is feeling good about dayside. Our team is working really hard and we have the full support of NBC News. You can see that in our reporting and we're glad our viewers see it too. We're excited to have the best month ever in nearly 5 years," an MSNBC insider told TheWrap. Back in the fall of 2015, MSNBC chairman Andy Lack made major changes to the network's daytime programming. Political programs such as "The Rundown with Jose Diaz-Balart" and "NewsNation with Tamron Hall" were replaced with "MSNBC Live," which is essentially a newscast. Lack's decision to focus on breaking news during business hours has paid off, and MSNBC has now topped CNN for 21-straight weeks among total day viewers. All the major cable news networks have shown daytime growth in 2017, thanks to Trump, Sean Spicer and a variety of breaking news, but MSNBC has easily picked up the most viewers. CNN and Fox News are both up 27 percent from the same point in 2016, but MSNBC has grown a whopping 64 percent. As much as MSNBC's talent disagrees with the president, he has certainly helped the network attract viewers.